The American Numismatic Association (ANA) has reaffirmed its commitment to supporting efforts to fight coin and bullion counterfeiting with a $55,000 contribution to the Anti-Counterfeiting Educational Foundation (ACEF), the non-profit organization that receives contributions to fund the work of the Industry Council for Tangible Assets’ Anti-Counterfeiting Task Force (ACTF). The donation was made during the August 18 ANA board of governors meeting at the Philadelphia World’s Fair of Money®. 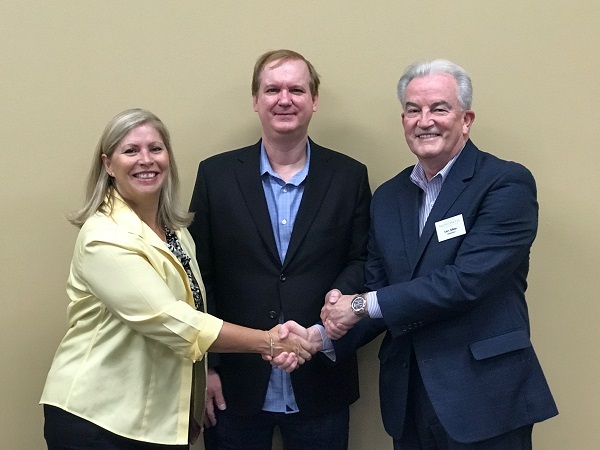 ANA President Gary Adkins (right) pledges a $50,000 donation from the national hobby organization to ICTA Executive Director Kathy McFadden and Greg Allen, chair of the Anti-Counterfeiting Task Force. Inducing the U.S. Customs & Border Protection Service and Homeland Security to value counterfeits at market value rather than face value in assessment of potential victim harm, leading to more investigations and awareness of the extent of coin counterfeiting. Successfully connecting law enforcement agencies within the federal government to facilitate their working together on cases involving counterfeit coins, bars and packaging. Assisting law enforcement in more than a dozen cases, one in particular which would have flooded the U.S. market with counterfeits valued at more than $48 million. Persuading the U.S. Customs & Border Protection Service to increase the number of coin packages inspected, resulting in thousands of counterfeit coins and bullion bars being seized before they enter the country. Creating a volunteer nationwide network of more than 90 numismatic experts to support federal, state and local law enforcement agents, allowing them to move quickly in the investigation of cases. Working with the U.S. Customs & Border Protection and Secret Service to determine the most effective and efficient means of providing training to agents in the field, nationwide. The $55,000 contribution from the American Numismatic Association is from the Numismatic Guaranty Corporation board designated fund ($50,000) and the David L. and Kathy Ganz endowment restricted fund ($5,000). Both funds are earmarked for educational programs.